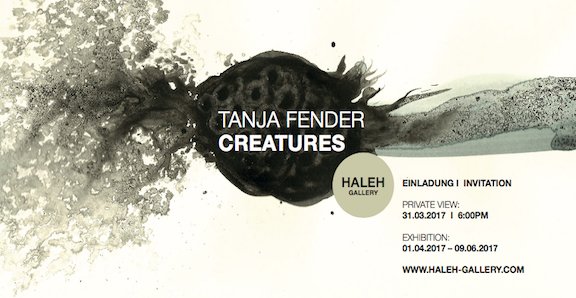 Haleh Gallery presents the artworks by Tanja Fender in her solo exhibition Creatures. Tanja Fender (*1973, in Winogradar, Kyrgysztan) investigates in her artistic work the question of differentiation between people and animals. Where is the borderline between similarities and distinctions? How to define human and animal life? In order to shed light on this question, Tanja Fender creates sculptures and watercolour drawings of animals. Made of different materials, such as felt, faux fur and silicone, the artist builds partially life-size sculptures of mice, rats, rabbits or bears. By means of sculpture Tanja Fender works very precisely and confers her animal sculptures a strong liveliness through human emotions of love, fervour, hate and timidity. This is also highlighted in the sculpture Zwei Mäuse (Two Mice, 2016), which is also on display at the exhibition in the gallery. Two mice are staged as human kissing lovers, made of plaster, polystyrene and oil colour. The animalistic and dark side of humans and animals are examined in the watercolour sketches. There we find hybrid creatures of man and animals, as a bird or worm woman. With this strategy the artists repeatedly scrutinizes the conceptual distinction between human and animal being. With this underlying conceptual approach, Fender’s artistic works can be located in the recent theoretical discourse of posthumanism and thus confer them a broader political relevance. Since the primary objective of posthumanistic philosophy is to overcome the factor of man as measure of all things. One branch of this school of thought deals with a similar question that Tanja Fender has articulated and that happens to be the distinction between animal and human being. At issue here are less the distinctions between the species, but the construction of an overarching connection between human and animalistic similarities. This can already be flawlessly observed on a genetic level. Tanja Fender (*1973, in Winogradar, Kyrgysztan) lives and works in Munich. She studied art at the art at the Fine Arts Academy in Munich with professor Norbert Prangenberg. From 2006-2008 she was master student with Prof. Prangeberg. Solo exhibitions (selection): “Hinter dünner Wand”, Kunstverein Bad Dürkheim (2016); “Zusammenfügung” Kunstverein Ebersberg, Galerie Alte Brennerei (2015). Group exhibitions (selection): “Verborgenes – Bestandsprobe III”, Museum Pfalzgalerie, Kaiserslautern (2016); Arkadenale_piep “10 Jahre Kunstarkaden”, Kunstarkaden, Munich (2015), “Irgendwas mit Löchern”, galerieGEDOKmuc, Munich (2014);IHAA Foundation Exhibition, Gachon University Seoul, Korea (2012).